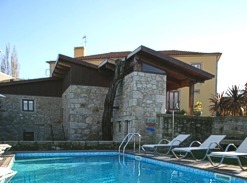 Accommodation at Casa D. Joao Enes Afife Residence. A recently restored 17th Century Manor House, with sea view, in Northern Portugal. Superbly located on a hillside in the north of Portugal, Casa D. Joao Enes enjoys magnificent views overlooking wooded countryside and the Atlantic Ocean. This former farmhouse dates back to the 1700’s and has remained in the ownership of the same family. The present owner is the grandson, ten generations removed, of the original owner. He has skilfully converted the farmhouse, preserving the original structure, into a delightful Manor House incorporating all modern features and comforts. It is tastefully decorated and furnished in the contemporary style. The accommodation consists of 2 twin bedrooms, 4 double bedrooms featuring king sized beds and 1 suite. All bedrooms have ensuite shower rooms except one which has ensuite bathroom. One of the twin bedrooms also has an adjacent double bedroom, ideal for a couple with children, who can share a bathroom. All bedrooms have central heating, Satellite TV, Internet, minibar and hair dryer. The suite also has a living/reading room. Located in an adjacent building is Casa do Alambique, a self-catering cottage, with 2 double bedrooms which feature king sized beds. There is also a separate bathroom and a separate shower room. The kitchen is fully equipped with 4 gas hobs, oven, fridge/freezer, dishwasher, microwave and toaster. The living/dining room features a large window overlooking the delightful garden. This room has a fireplace, sofa with chaise longue and two armchairs, dining table for 6 people, home cinema and internet. The bedrooms, living-room and kitchen are centrally heated and all have Satellite TV. Casa da Eira is a typical Minho style house from the beginning of the 17th century. It has 2 cosy double rooms with private shower room, living room and fully equipped kitchen. In the garden, there is a swimming-pool with sun loungers and a barbecue. This is the perfect place to relax while enjoying the peacefulness of the countryside. Casa D. Joao Enes also has facilities suitable for small business meetings etc. It is also suitable for special occasions such as family gatherings, anniversaries, Christmas or New Year celebrations. On these occasions all bedrooms in the main house would have to be rented. Casa D. Joao Enes is only a 15 minute walk to the beach. There is a restaurant and a grocer’s shop about 800 metres from the house. Further restaurants and shops can be found in the village centre of Afife approximately 2 kms away. The beautiful historic town of Viana do Castelo is approximately 10 minutes away by car. It is not allowed to smoke indoors. Pets are not allowed.